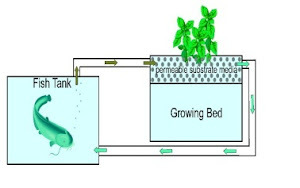 One of the essential decisions in planning an Aquaponics garden is what type of fish are you going to raise; ornamental or a food source species? If you have no previous experience, it is generally recommended that you use inexpensive Gold Fish for you Starter Aquaponics Garden. Gold Fish are inexpensive and are not as vulnerable to stress as some other species are. Fancy goldfish require a very minimum of 20 gallons/75 liters for the first fish and 10 gallons/40 liters for each additional fish. Single tailed goldfish require even more room, as they are strong swimmer and can grow very large. Goldfish can grow up to and sometimes over 12 inches long and live well over 10 years when cared for properly. Check out Koko's website for excellent information on goldfish care! In addition to multiple topics she has a forum. Koi, a display fish in ponds, also can be an ornamental choice and if they have vibrant coloring and are healthy can provide an additional income by selling them. Silver Perch are flexible to weather conditions and are easy to maintain because they feed on green fodder that you can grow in your Aquaponic system. Drawback = The time to grow them is 12 to 18 months. Trout like cool water. They grow large quickly. Tilapia is the most popular fish for for home Aquaponics because they survive well in changing environments. Drawback = A warm water fish which may provide a challenge locally. As we move on we will learn from Ohio breeders which varieties are being raised successfully. Yellow perch, bluegill and largemouth bass are the top three cultured species in Ohio. Note: If you mix breeds be sure they are compatible with each other. Watch us learn and grow fish. Aquaponics: Catch her, hatch her, catch her hatch * 5:12 mins Some video of the tilapia breeding tank. The clips of momma fish with babies are from last week, I HOPE to get live footage of a hatch soon, but the fish have a tiny little fish-mind of their own. Fish and Aquaponics * BrightAgroLLC * 3:54 mins. Bright Agrotech's Co-Founder, Nate Storey Ph.D, discusses the different components of raising fish with your aquaponic system. Fingerlings transfer to tank, HD Aquaponics - Ep.23 - 7:48 mins. This week we take a look at the new acclimated blue tilapia we added to the breeding tank. We also get to take a look at this weeks aquaponics greenhouse update. The plants are really starting to take off and I'm looking forward to all the fruit that is starting to set. #3 - DIY Small ScaleBackyard Tilapia Farm * fishandworms * 8:23 mins Nice clean set-up. Breeding Tilapia in Loxahatchee, FL #1 * tilapia man * 1:46 mins. Breeding Tilapia on my back porch. The cage in # 2 is really simple. 1:22 mins. The wire came from Home Depot .1 inch PVC pipe and 4 inch PVC pipe. You can make any size you want. . If you look you'll see part one part two part three part four part five part six part seven. It'll give you﻿ a rough idea of what we are playing around with. Note: 20-some interesting videos.